(Clockwise) Afreen Rahman, Zakia Soman, Shayara Bano and advocate Farah Faiz. Afreen and Shayara received divorce by Speed Post. Instant triple talaq – which the supreme court banned recently, while asking the government to legislate against the decadent practice – is something Muslim women had no doubt wanted to speak up against but couldn’t muster strength to bring about progressive change. It took five Muslim women, who received little if any support from the community and were opposed by religious leaders, to finally go to court and have the practice halted. 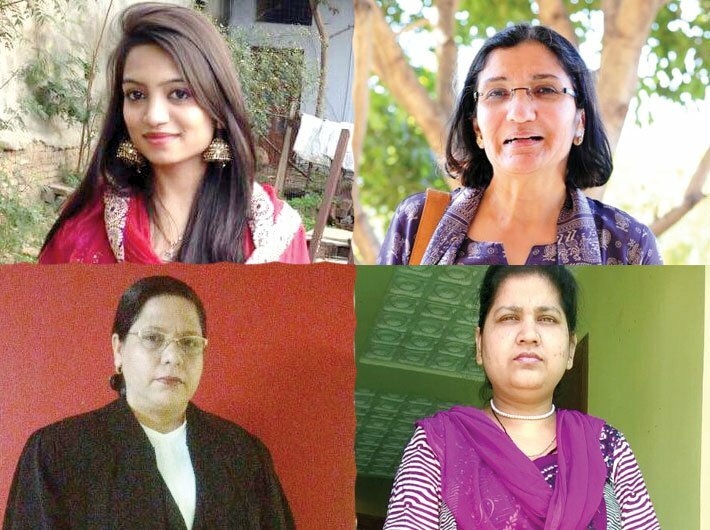 Despite the court’s decision, many religious leaders, particularly those of hardline views, continue to say this is no victory for women; that women in the community were always well looked after; that none of their rights was being denied to them; that talk of Muslim women being exploited was nothing but rumour. But the stories of the women who took the case to court, and the threats they faced, in themselves speak of how women in the community are victims of sexism. It was never an easy journey for Farah Faiz, who comes from a family of progressive Muslims of Saharanpur. She remembers an uncle who faced opposition for his progressive views on Islam. Later, she faced opposition from the community for marrying a Hindu. Armed with a law degree, she launched a campaign to make women aware of their rights, including the right to protest if they felt something wrong was being imposed upon them. In the supreme court, she brought home the fact that triple talaq was not just a matter of going against shariah; there were many other factors to the issue. The court, convinced by her presentation of the case, agreed to look at triple talaq and a nine-member committee looked at all aspects. Despite pressure from the All-India Muslim Personal Law Board (AIMPLB), Faiz did not withdraw the petition. And, as is now well known, the court ruled against instant triple talaq. The shock arrived by Speed Post: a letter told Afreen Rahman, a native of Jaipur, that she was no longer her husband’s wife. Her fault? She says, she had met with a serious accident and her husband now considered her a liability. It didn’t matter to her husband that Afreen had lost her father some years ago and that her mother had died in the accident that left her disabled. Afreen has an MBA, speaks English, and is like many other young Indian professional women. Her marriage wasn’t too happy to begin with; she had been complaining of harassment, dowry demands, beatings. Tired, she had come to live at her parental home when the accident happened. “I was shattered initially that I have just been sent a Speed Post and informed that I am no longer part of a union that was supposed to last forever. It was humiliating and tough. After the accident, everyone looked at me suspiciously. Since I still cannot sit for long hours. I get a swollen leg and it restricts me from walking and moving around,” she says. Despite feeling humiliated, she decided to fight it out alone. A Jaipur-based NGO supported her in the battle. Not surprisingly, religious heads actually discouraged her from fighting it out. Shayara Bano, a graduate, was married to an Allahabad boy. From day one, she was told she is not good looking and not needed. She was made to undergo seven abortions, and at one point, when she was left extremely weak, the boy’s family refused to bear her medical expenses. She was abandoned at the Moradabad railway station and her family was told to take her back. On reaching home, she was divorced via Speed Post. The husband continues to keep the two children she bore him. “Leaders of the AIMPLB met my father and explained him that this is tarnishing the image of our community and religion. Fighting such a baseless thing would take us nowhere. So we should withdraw our petition. He was told to think and inform the leaders. The leaders kept calling us to withdraw for months. They told us the demerits of bringing the whole matter into the public domain,” she says. Now, she has enrolled for an MBA and is determined to gain custody of her kids once she is financially independent. Zakia Soman would be a familiar name to those who remember the Bharatiya Muslim Mahila Andolan’s fight to have the Haji Ali shrine in Mumbai opened to women. A lawyer herself, she however had herself represented for the triple talaq case by lawyer Anand Grover. Facing threats, she says, is part of the process, the struggle. She says the practices are ages old and, since the community is not as well-educated as some others, Muslim women have very little awareness of their rights. Anything imposed as ‘religious’ is followed without question, she says. Even if they suffer, they are unwilling to come forward and speak about it.